Express Imprint Blog - Are You Ready for Some Football? Promote Your School and Make Money! The hot days of July and August are eagerly welcomed by football fans – because summer means that football season’s almost here. Mid-summer is also when schools, booster clubs and maintenance crews get everything ready for the hundreds or thousands of rabid fans who will be showing up to root for their team. Equipment is cleaned, fields are manicured, tickets and programs are printed, and the people responsible for providing food and drinks to hungry fans are ordering supplies. • Do you want your fans to buy drinks and then just throw the cups into the garbage? • Or do you want them to take home a beautiful souvenir cup, so your school or team’s name and logo sits prominently on their desk, bookshelf or mantel? Anyone who understands the importance of building brand loyalty would naturally choose the second option. The way to develop and maintain a devoted fan base is to promote and encourage fans’ identification with their team. A keepsake reminding them of the great time they had at your game is a key ingredient in strengthening that bond. It’s an even easier choice to make when you realize that you can be making money for your school or organization at the same time. Attractive stadium cups printed with your team’s logo and name don’t cost a lot, but fans are willing to pay quite a bit more for a quality souvenir container instead of a cheap throwaway cup – and that’s pure profit you can use to support your school or team. In these days of budget cutting, this can become an extra revenue stream that’s more important than ever. There will be less trash to haul away after the game, too! There are a number of ways you can develop a beverage container program. 1. Standard stadium cups – you can purchase these, in bulk, in a large selection of colors and in several sizes. If you purchase them from our online store, you can have a custom imprint on both sides of the cup at no extra charge. Charge an extra $2.50 - $3.00 for a high-quality souvenir cup (with extra refills, if you’d like) and you’ll be amazed at how much you can raise for your team. 2. Travel mugs – if you’re in a cold-weather area, don’t forget that it can be a bit chilly for games in November and December. That means you’ll probably be selling a lot of coffee or hot chocolate, and what better container to sell them in than a reusable, imprinted travel mug? People are always looking for new and unique mugs, and you can be sure these will get a lot of use – and your team will get a lot of exposure – at home or at the office. 3. 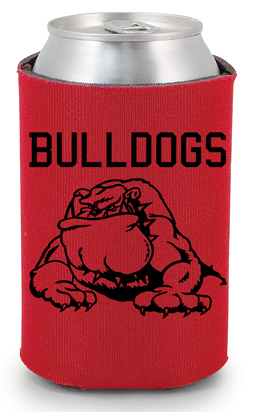 Custom koozies – you probably don’t allow cans at the game anymore, but don’t forget about the tailgaters. This is a product they’d be thrilled to use before and after the game. Imprinted cloth-and-felt koozies can be purchased in as many as 25 different colors with your name prominently featured, and will be something they’ll take with them whenever they’re out enjoying a cold beverage. They also come in a variety of sizes and shapes, and you can even get a supply of zippered bottle coolers to sell to fans who prefer bottled beer. Make this selection available at your beverage booths or tables and see how quickly they get snapped up. Fans love to show off their loyalty, and teams love extra revenue. Imprinted stadium cups are, quite honestly, a win-win for everyone.